Connecting display LCD through USB port is not something new but there is always a high demand due to its easy and multiple connectivity support. Just recently, OWC (Other World Computing) has just unveiled a new USB 2.0 display adapter that can be used in both Windows and Macs machine to support multiple displays without relying on limited graphics display ports that being designed in conventional motherboard. Typically PC chipset doesn’t have much option except VGA or DVI port being extended directly from internal architecture. But this has never been sufficient and good thing now is users can always top them up by connecting display interface through USB ports that are quite common in today’s PC market. 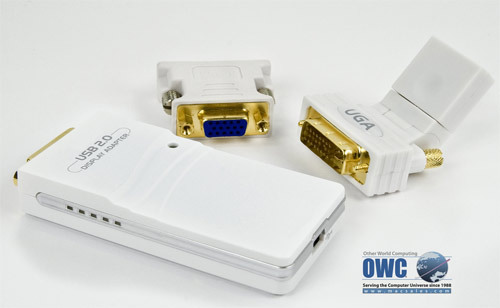 The specialty about the OWC adapter kit is it consists of a full set of variety, with a USB to DVI adapter, which the DVI can be further converted to VGA or HDMI through the swivel adapters. Surprisingly, it is able to scale up the display resolution up to 1600 X 1200 pixels with full 32-bit color without being constrained by USB host port with theoretical peak rate of 480Mbps. At retail price of $100, the USB display kit is quite an affordable solution and users can choose to have up to maximum of six displays simultaneously in cloning mode.